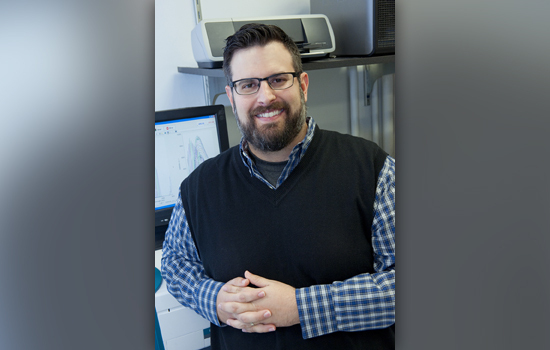 Todd Pagano, founding director of the Laboratory Science Technology program at Rochester Institute of Technology’s National Technical Institute for the Deaf, has been named the recipient of the 2016 Outstanding Undergraduate Science Teacher Award by the Society for College Science Teachers. He will receive the award at the National Science Teachers Association national conference in April in Nashville, Tenn. The award is co-sponsored by Springer publishing. Pagano is being recognized for his highly successful, American Chemical Society-approved program to prepare deaf and hard-of-hearing undergraduate students for technological careers in chemistry. More than 60 students are enrolled in the Laboratory Science Technology program at any one time, with about 80 percent of those students completing the program and 98 percent of those who graduate securing jobs or continuing their learning through additional education and advanced training. Both of these metrics exceed the success rates of their hearing peers. As a testament to his passion for student success and building and leading the LST program, Pagano has helped to place a large number of his deaf and hard-of-hearing students into meaningful careers and cooperative education placements in the sciences. He also actively involves his students in conducting scientific research. He has been honored by his students for his work in building exciting, rigorous and student-centered courses that prepare them for chemistry careers beyond the classroom and for promoting research projects among his students. Pagano was named the United States Professor of the Year for 2012­–2013 by the Council for Advancement and Support of Education/Carnegie Foundation for the Advancement of Teaching. He was also named to the Fulbright Specialist Roster in 2015. Pagano has published numerous articles and books about working with underrepresented students in STEM fields. He is a Fellow of the American Chemical Society and has authored a number of technical papers in environmental and analytical chemistry and given nearly 200 presentations at technical conferences. His undergraduate student researchers are often co-authors on these publications and presentations.